Blame the government. OK, it’s a little more complex than that, but not much. You see, in 2014 the FCC changed the rules on cell boosters. Before that, if you wanted to improve your cellular signal you could buy a kit, or you could buy exactly the parts you wanted. Unfortunately, cellular companies like AT&T and Verizon claimed that using a signal booster could void your phone’s warranty and they even made some really off-the-wall claims like signal boosters could bring down the whole cell network if you installed them wrong. On the other hand, cell booster companies said that their modern cell boosters were completely safe if installed properly and that they provided plenty of help and support so people could get just what they needed. Companies like Solid Signal were stuck in the middle, giving people the best available information and helping them to get the cell signal they needed. Eventually, after a lot of work on all three sides, cell service providers, the FCC, and cell booster companies came to a compromise. They laid out new rules: Every cell booster would come with anti-feedback circuits so that there was no way the cell network would be overloaded. Every major cell service provider would pre-approve any new system by a booster company, and you as a consumer would be required to file paperwork with them when you put in a booster. And… more importantly for this article, all boosters would be sold in kit form unless it was designed for professional installation. Why are kits important? Making sure that you have the right antennas and cables means that you’re more likely to make the right decision when you install. 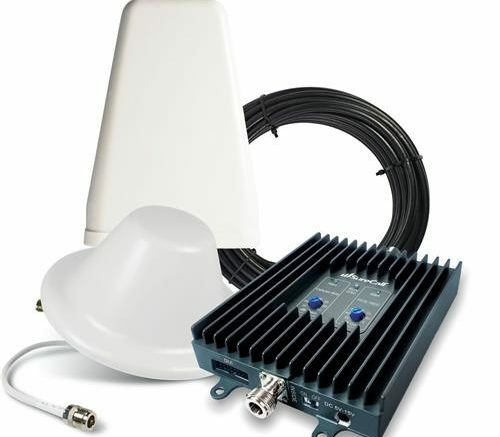 You can still buy a more expensive antenna if you need one, but most likely you’d be coming to that decision with the help of a professional like the experts at Solid Signal, and we’d help you choose something that was right for you and would help your new cell booster work the way it should. If you have an existing booster and need to replace just the amplifier part of it, it’s not impossible. If it’s fairly new, you can contact the manufacturer and there are ways around the rule. However, there are so many new features on the new booster systems that sometimes it’s just as well that you have to upgrade everything that the same time. It ends up delivering a much better solution to you when you need it. If you haven’t put in a cell signal booster yet, by getting a kit you know that you’ll be getting everything you need. You’ll even get the cables you need to run the outdoor antenna inside, as well as easy-to-follow instructions that guide you each step of the way. By creating kits, it makes it easier for both the manufacturer and Solid Signal to support you and that’s a win for everyone.